So I’ve been contemplating writing a blog about #blacklivesmatter for some time. I’ve been torn. On one hand, I’m white and I do not want my voice heard over any person of color’s. The whole point of BLM is that their voices, their experiences, aren’t being heard. They should be, need to be, heard. Their stories are what we should be listening to right now. But on the other hand, as Martin Luther King, Jr. said, “There comes a time when silence is betrayal.” To not speak up about an injustice seen is to condone said injustice. So I refuse to be silent. Here’s what I hope to accomplish with this post. First, explain why the #blacklivesmatter movement is needed. Second, attempt to answer a few criticisms of BLM that I’ve seen around. And third, hopefully illustrate why those who say #alllivesmatter or #bluelivesmatter are not helping, and why they are missing the point. Let’s get to it. Image from @jessiefox_ on instagram. There’s also a damning graph in the article that’s based off the information of the four states that best track their traffic stops (Connecticut, Illinois, North Carolina, and Rhode Island). Across the 14 different agencies throughout the four states, every agency pulled black people over more often. The highest difference being the Chicago Police Department at 5.2 times more often, and the lowest being North Carolina State Highway Patrol at 1.5 times more often. The second graph compares the chances of black and white drivers that were searched carrying contraband. Out of the 14 different agencies, only the Rhode Island State Police found contraband on black drivers more often. Illinois State Police found contraband in equal amount and the other 12 found contraband on white drivers more often. The rest of the article spends time talking about individual cases of black people being pulled over, arrested, beat up, tazed, and much more, for nothing more than the color of their skin. It’s worth reading. Another glaringly obvious discriminatory practice in the United States is how the War on Drugs has been waged almost exclusively on black and brown citizens since its start in the early 1980s. I’ll try to get into some of the issues here, but if you’d like to really dissect mass incarceration, I’d recommend reading Michelle Alexander’s The New Jim Crow: Mass Incarceration in the Age of Colorblindness. In some of the statistics I’m about to list, it’s important to remember the demographic makeup of the USA. For our purposes: white Americans are 72.4% of the population (around 223.5 million) and black Americans are 12.6% of the population (around 39 million). When looking at drug use, black and white Americans use illicit drugs at almost exactly the same rate (6.6% of white Americans and 7.7% of black Americans). But when you look at actual numbers, it drastically changes the story of who’s using in America. With the above percentages and population numbers, we have 14.7 million white drug users and a little over 3 million black drug users. Speaking of mass incarceration in general, 1 in 100 Americans are currently behind bars. This is a travesty of monumental consequences. This also directly creates more crime. When any of these men and women leave prison after fulfilling their punishment, they are barred from jobs, licenses, housing, and even voting in many states. They are officially a criminal, a second-class citizen, until the day they die. How do you think they are going to leave the life of crime if we don’t let them. If they can’t drive, can’t be employed, can’t vote, can’t find housing, what do you think they are going to do? The harsh measures enacted by the War on Drugs gives them few options other than resorting to measures that would lead back to prison. And let’s break down the incarceration numbers a little more. Looking at citizens divided by gender and race, 1 in 106 of white men are behind bars while 1 in 15 (!!!!!) of black men over the age of 18 are behind bars. And with black men between the ages of 20 and 34 the ratio jumps to 1 in 9. Can you fathom that? I can’t. And this is with 11 million more white drug users than black drug users. …violent crime rates have been relatively constant or declining over the past two decades. The exploding prison population has been propelled by public policy changes that have increased the use of prison sentences as well as the length of time served, e.g. through mandatory minimum sentencing, “three strikes” laws, and reductions in the availability of parole or early release. Although these policies were championed as protecting the public from serious and violent offenders, they have instead yielded high rates of confinement of nonviolent offenders. Nearly three quarters of new admissions to state prison were convicted of nonviolent crimes…. Perhaps the single greatest force behind the growth of the prison population has been the national ‘war on drugs.’ The number of incarcerated drug offenders has increased twelvefold since 1980. -A study conducted dealing with McCleskey v. Kemp court case found that in Georgia, prosecutors went for the death penalty in 70% of cases involving black defendants and white victims. When the defendant was white and the victim was black, prosecutors sought the death penalty only 19% of the time! Now, it’s obviously impossible to start comparing criminal cases because each and every one is unique, but determining that there’s a discriminatory choice made when the death penalty is sought is hard to argue against. And really, I could go on forever with statistics. But I shouldn’t have to. Experiences cover the spectrum, but disturbing trends make themselves known. In light of recent events, listen to what the Dallas surgeon who cared for victims of the police shooting said. Or Republican Senator Tim Scott talking about being pulled over 7 times in a year. Or talk to any person of color in your life. Ask them about their experiences. Learn from them. Empathize with them. I agree that racism is bad, but why do you have to block roads and highways? This has always been a tactic used by non-violent protests. From Gandhi to Martin Luther King, Jr. to #blacklivesmatter, if their protests aren’t disruptive, they aren’t listened to. They are forcing you to hear them because they’ve been ignored for too long. And you think being a little late getting home is worse than dealing with systematic and individual racism on a daily basis? Non-violence? There’s been violence committed at BLM rallies. …it is not enough for me to stand before you tonight and condemn riots. It would be morally irresponsible for me to do that without, at the same time, condemning the contingent, intolerable conditions that exist in our society. These conditions are the things that cause individuals to feel that they have no other alternative than to engage in violent rebellions to get attention. And I must say tonight that a riot is the language of the unheard. What about “black on black” crime. Why aren’t they protesting that? First off, using that term is incredibly racist and unnecessary. Nobody wants crime. But to put it in such a racist frame is not helpful. Violent crime is usually committed by somebody you know or live nearby. So that means most white victims had white attackers and most black victims had black attackers. And also, it’s just a talking point not based in fact. Most leaders of #BLM are leaders in their communities that are incredibly active in anti-crime and anti-drug organizations. But more importantly, those crimes are being handled by the judicial system. Someone commits a crime, you call the police, justice is serviced (albeit possibly discriminatorily). 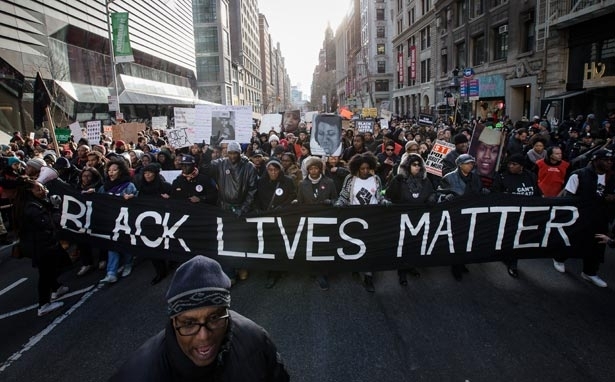 What #blacklivesmatter is protesting is police brutality. Police should be held up to a higher standard than violent criminals. We expect violent criminals to commit crimes and we expect justice to be served. Most of the time, it is. But we expect the police forces across our nation to serve and protect their communities, not shoot unarmed citizens. And that’s not always the case. Can we not hold police to a higher standard? They are just exasperating race relations in America! Pointing out racism isn’t making it worse. It’s the first step in righting the wrongs of institutional racism. This finally brings us to the issues of using #alllivesmatter and #bluelivesmatter as a response. -Saying all lives matter is like a fire department spraying water on a house that isn’t on fire while another one burns down because all houses matter. -It’s like neglecting to give somebody food at the dinner table, and then when they ask for it, saying all people deserve food. -It’s like telling somebody wearing a breast cancer awareness pin that all cancers matter. -“Save the Rainforest” doesn’t mean to forget about all the other trees. -“Save the Dolphins” doesn’t mean to kill off all other sea life. If you truly believed all lives matter, than you would have no issue with BLM fighting against police brutality. The ideas aren’t mutually exclusive. The issue is that most people using #alllivesmatter are doing it as a negative response to #BLM, to stop the conversation. Now I only have two points to make about #bluelivesmatter. First, it’s usually the all lives matter people that use it. I find it odd that they think #blacklivesmatter means only black lives and nobody else, but #bluelivesmatter doesn’t mean the exact same thing. I don’t think you’re saying only cops matter. So why do you think they’re saying only black lives matter? Secondly, being a cop is a difficult job that deserves respect. It can be dangerous, and I commend each and every person who chooses to go into that profession. But that’s all it is at the end of the day, a profession. When they aren’t in uniform, their lives aren’t at higher risk. If they decide the risk is too much, they can change jobs. People of color cannot change their skin color. They are born that way. It’s not changing. If you’ve made it this far, thank you for reading and I hope you’ll click on some of the above links to dive deeper into these issues. I don’t think I’ll change the world with a few words, but if even one person starts seeing things differently, starts to realize systematic racism exists, realizes #blacklivesmatter is an important movement, I’ve accomplished what I wanted to. This blog post was written with the desperately needed proofreading and editing help of Josh Reed, Lacy Benoit, and Tara Holtzclaw. Thanks for everything! !